Making homemade pickle relish is super easy and so very delicious. Kick off summer with this throwback classic, perfect in all its simplicity. Combine the vinegar, mustard seeds, fennel seeds, ground coriander and sugar in a saucepot and bring to a boil over medium heat. Reduce the heat to a simmer and cook until the liquid is reduced by half. Meanwhile, in a mixing bowl, combine the diced pickles, red and yellow bell pepper, onion and dill. Pour the reduced liquid over the vegetables and mix well. Refrigerate for 2 hours before serving or can the relish and store in the refrigerator for later use. (The pickle relish will optimally last up to 2 weeks in the fridge). Heat your backyard BBQ or a grill pan on top of the stove to medium-high heat. Grill the hot dogs until golden brown on all sides. Gently toast the hot dog buns and place a hot dog in each bun. 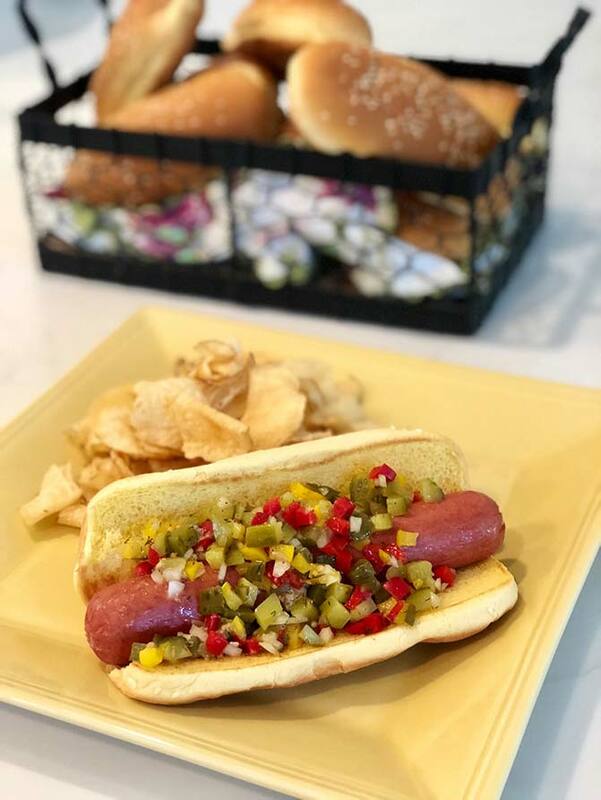 Top the dogs with Homemade Pickle Relish and serve with an offering of mustards.